The Commonwealth Bank Southern Stars have regained the Ashes on UK soil for the first time since 2001, taking out the multi-format points-based system 10-6. It’s been a long journey for the Stars since the first one-day international in Taunton on July 21 and their victorious tour of the British Isles has seen them win the ODI leg of the Ashes 2-1, thrash England in the standalone Test and defeat Ireland 3-0 in a Twenty20 series before succumbing to the hosts in the three-match T20 portion of the Ashes 2-1. 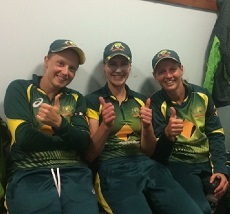 Sunstar trio Ellyse Perry, Meg Lanning and Alyssa Healy all played pivotal parts in the series in what was a fantastic collective team effort. Alyssa was immaculate behind the stumps and also provided important contributions with the willow throughout the series. Meg Lanning led from the front with her strategic nous as captain and second leading run scorer in the series with the only player to register a century. Ellyse further stated her status as the best Female Cricketer in the World –She finished the series with 264 runs at an average of 33 and 16 wickets at 13.43, Ellyse topped both the run-scoring and wicket-taking tables and was deservedly named player of the series. Incredibly, it is the second time Ellyse has managed the feat, after she was also named the series’ best player in 2013-14 after topping the runs table and finishing equal-first in the wickets alongside teammate Rene Farrell. The girls now have a well deserved break before embarking on their domestic season with the WNCL and highly anticipated WBBL. The Australian Men’s side didn’t have the desired success of the Women’s team after losing their Ashes series to England 3-2. Mitchell Starc had a solid series and was Australia’s highest wicket-taker with 18 wickets at 30 with two 5-wicket hauls. He also chipped in with two half-centuries. He is now about to commence a 5 match ODI series against England followed by a short break in Australia and then a tour to Bangladesh in October.